Ask fellow campers about "Crystal Hot Springs" and nearby attractions. We wanted to enjoy the hot springs so we decided to camp here. I called ahead on a Thursday to make a reservation for Sunday-Tuesday and the woman on the phone said "We are all booked this weekend." And said, but do you have Sunday night available? And she kept saying "No, the weekend is all booked." I found that hard to believe - I was thinking everyone would head out by Sunday. We decided to chance it and try and walk in. We had a list of backup campgrounds just in case. It turns out, they had plenty of open sites! Only about 6 other campers were there - the rest of the sites were empty. We picked a site in the back by the water that was shaded. There are full hookups. We did check out the bathrooms but they were quite messy - probably because of everyone that just left from the busy weekend. We went to the hot springs pool on Monday. It is $1 off the rate if you are camping there. The pools are really nice and it wasn't too busy on a Monday. 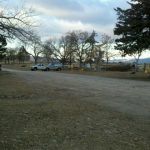 There is a nice Walmart, Smiths grocery store, laundromat and plenty of restaurants just down the street in Brigham City. It was a cute little town that we really enjoyed. We camped at Crystal Hot Springs in a Travel Trailer. Interior roads, while wide, had potholes. We camped at Crystal Hot Springs in a Fifth Wheel. Hot Springs within walking distance but was an additional fee. Hot Springs are crowded during the evening. This campground is mostly for people using the pool and hot springs. We just used it for a stop over which made it a little pricey for what we needed. But the actual camp sites were larger and well shaded with lots of grass. Is a few miles away from interstate which made it quiet. We camped at Crystal Hot Springs in a Fifth Wheel. We choose this park because we wanted to visit the Hot Springs on site. 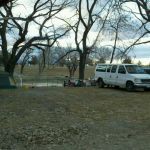 The campground spaces are very close to each other, grassy with some trees. We were here on a Saturday afternoon and both the campground and Hot Springs were very crowded. This campground caters to families, so the noise level is a little high. It is important to note that you don't want to drive down to the office in your RV, as there is no turn around area and you will get stuck. Park at the entrance and walk down to the office, which is next to the pool area. We were excited to use the hot spring pools, but we were very surprised at the color of the water. It is very dark brown. Upon reading the literature the color seems to be from the abundance of minerals. I will admit that the combination of brown water and the huge amount of people in the pools was not as inviting as I had hoped. There are several pools of different temps and one very large one. The small pools were packed with people. Thank goodness for the larger one - it gave the appearance of not being as crowded. There are a lot of families, so again it is anything but peaceful. They even have a water slide for an extra fee. We enjoyed walking around the grassy hill area surrounding a small pond. People do not hesitate to walk through your site, so make sure you put your things away at night. We awoke to our dog fence collapsed on the ground and several beer cans in our site. Upon investigation, we learned that young adults had been walking through our sight all night and some had fallen over our dog pen. We camped at Crystal Hot Springs in a Motorhome. The hot springs were fun. But the showers and bathrooms were very dirty. 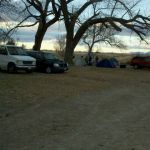 The campground area was very crowded and there were loud parties throughout the night. Very few trees. Really hot and dusty. Would recommend the hot springs but would not stay in the campground again. We camped at Crystal Hot Springs in a Tent Trailer. This is a Family park. Lots of children, bikes, etc. Sites are very close together. Bathroom was a large open area which needs updating. No private area to dress/undress so keep your things within reach. We camped at Crystal Hot Springs in a Fifth Wheel. Showers were cold. The kids loved the waterslides and pools which is extra, but worth it. I would stay here again, affordable and quiet in the evening where we were. Verizon cell phones worked in the park. We camped at Crystal Hot Springs in a Motorhome. When we first started staying here years ago, the park was not well maintained & pretty run down. The last couple of years we have noticed a gradual improvement. The biggest improvement is that they are watering the grounds. The spaces are decent sized. It is very pet friendly. We will definitely stay here again. We camped at Crystal Hot Springs in a Motorhome. This is a campground connected to a water park. Everything the other reviewers say is true. Lots of kids running around. No Wi-Fi or cable. Showers aren’t really clean and are without a changing room since they expect you to be wearing a swimsuit. Registration is weird. Park near the garbage bin and then walk down to the main office. Yet, we loved it. Beautiful green grass and trees. Gorgeous mountain. Life can’t get better than this! We camped at Crystal Hot Springs in a Motorhome. Nice grounds with shade trees. To swim in the hot springs costs extra. Popular location. Very kid friendly. Restrooms and showers were dirty run down and not stocked. Noise from train several times overnight. We gave lower score because of the bathrooms, showers and laundry facilities. We camped at Crystal Hot Springs in a Travel Trailer. Park was very crowded when we stayed there. They were updating some sites and the old restrooms. For an over-night stay it would be a good place to go. The spaces seemed tight to me and a little to much "on top" of each other. The attendants at the pool where you check in were very courteous and helpful. We camped at Crystal Hot Springs in a Fifth Wheel. Was not well maintained; garbage could be seen a lot of places, also seemed to be many "long term campers". We were parked close to the road. That coupled with the people next to us who's dogs barked constantly while they partied (and sometimes when they didn't) made this a park that I would NOT go to on a weekend again. The hot springs are nice; four separate pools of them. Just too crowded on a weekend for us. LOTS OF KIDS AND DOGS! We camped at Crystal Hot Springs in a Motorhome. You will hate or love this place depending on your feeling about hot springs. Avoid the camp restrooms use the lodge units and no the smell you may encounter is not the sewage system; it is the cows next door. I would never stay here if it were not for the hot springs. That said I always stay here on my way north or south because of the springs. Staff is friendly and a whole lot cleaner then the camp bath houses. This could be a great destination for families. I am sure it has been and will be again. We camped at Crystal Hot Springs in a Fifth Wheel. I arrived on a busy weekend, and thought the park was full. The office said there were just a couple of sites left, and I expected the worse. I ended up with a beautiful, spacious site with lots of lawn and a great view. Many of the sites were much more crowded however, and looked like more of a challenge to back in to. So choose your site carefully. The park offers a Good Sam and AAA discount. Even though it was late in the day, the pools were clean, and made for a relaxing overnight stop. 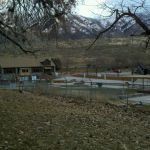 There is a second campground, more rustic, and without electric ($15), on the hill above the hot springs pools. The campground is handy to the interstate, so I plan to stay again on my next trip through. We camped at Crystal Hot Springs in a Travel Trailer. We were very disappointed with this campground. Barely maintained and very dirty and smelly. You also get a strong farm smell from local cows. Bathrooms and showers were the worst I have ever seen. The site next to us had an overflowing sewer hookup adding to the overall farm animal aroma. Do not be fooled by the Hot Springs, this place seemed to be a good place to pickup a disease. There was also a building structure that was ready to collapse that children have easy access to and no posted warning signs that we saw. We camped at Crystal Hot Springs in a Travel Trailer. Are you affiliated with Crystal Hot Springs ?